This weekend, America honors veterans for their patriotism, love of country and willingness to serve and sacrifice for the common good. 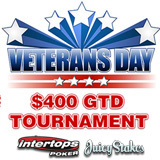 Intertops Poker and Juicy Stakes, the two most popular online poker rooms on the Horizon Poker Network, will host their Veterans Day $400 GTD 6-Max Freeze-out Tournament the day before Veterans Day so it doesn’t conflict with celebrations and ceremonies. You can buy-in directly or win your way to the $400 GTD poker tournament by winning one of three free roll satellite tournaments held earlier in the day. Speedy 6-max poker tournament format has been popular with players at Intertops Poker and Juicy Stakes. Players from anywhere in the world can register for these tournaments under the Tournaments tab in the poker rooms. Intertops and Juicy Stakes are also giving players a chance to win their way to the AU$1,000,000 Aussie Millions. Online satellites for the opening event next January continue until the Final this Sunday. The winner will get a AU$3500 prize package to compete in the most prestigious poker tournament in the southern hemisphere. Step 1 tourneys with just a $3 buy-in are held at both online poker rooms every six hours until November 11th. Players can win their way from Step 1 to the Final or buy-in at any stage. For the full tournament schedule and prize details, see Intertops Poker Aussie Million Satellites or Juicy Stakes Aussie Millions Satellite Tournaments.